Would you enjoy having overall TDM score? I was thinking if TDM could exchange data about mission's endscreens with player's account and merge all of them into one big player's score. I know it rises a lot of problems (like required internet connection and online database), but I found fulfilling general thresholds and goals very entertaining in many games, making me play them again and again even after I satisfied my initial curiosity. --does endscreen shows all "rewarding" and measurable things about players performance in this new light? how different missions can be compared in unified way? --how it can deal with console commands like "notarget"? I could use a command and don't even remember about it, could the game recognise use of console and make a note in a savefile, and later refuse to use it in overall account score? I think we discussed having an Achievements \ Leader-board system once or twice before. than a small majority of forum users going "yep, that would be cool". Surely it needs at least one person with programming skills to show any actual potential, but whole system could work as an upgrade to mission selection list: % of missions finished, plus a summary of all scores. The problem with this list is that it's gone once you make a fresh install, so this data could be stored just as other save files and copied between old and new install. I'm not sure about total score being relevant, as there are many missions so different from each other in terms of difficulty, as every mapper has their own idea on how Normal/Hard/Expert level should look like. That said, I wouldn't mind more score-oriented FMs, like challenge maps, time trials, etc. Edited by Judith, 03 July 2018 - 05:10 AM. My only real concern is would this take resources away from the core development team or will someone else be stepping up to code it ? Right now TDM does not collect any information about players to send it anywhere. At least for me, a suggestion to create any sort of account in-game or connect to something usually generates negative feelings. This is the only real downside from adding such feature. 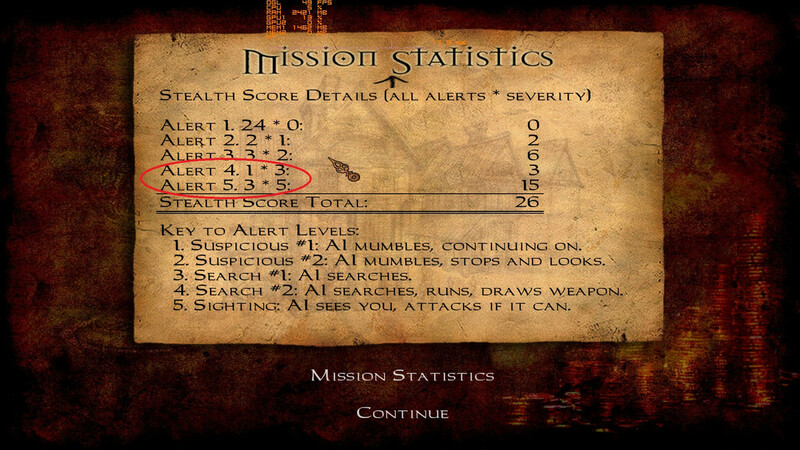 About the score, why Alert 4 is weighted "3" and Alert 5 "5" and not "4" ? It indicates that you maybe even don't care at all, hence it could be any bigger number measuring "stealth". That was just in relation to someone's wanting a GUI display of stats mid-mission, not for persistent storage of anything even on the local machine. It's an interesting idea, and, how i know players, it could be extra motivation for some of them. Personally, i'm too bad to be competitive anyway, so, it won't change anything for me , but, there's a lot of competitive people out there. Frankly, though, i think the "problems" are elsewhere. Just not enough folk discover TDM. Steam could have been a good way to attract new player, but, i'm afraid that, once again, a open source license rather made things more complicated than the opposite. Thinking more about the topic, i feel like it is too much work without a real benefit, so, i'd rather vote for "I don't care, TDM works best as a direct Thief's descendant." I think it's nice to have mission stats, as it was in the original Thief's (and TDM obviously even improves on that), but, can't see how a handful of online records could add more to that. Edited by chakkman, 24 September 2018 - 03:17 PM. It don't have to be online, it could be a cumulative version of existing mission stats - you could have one "ending stats" save file for all played missions. I see it more like a challenge to play again missions you screwed more than others. With maths proposed in first post you would add new value to overall score with every new mission, or have a rank with two values: A= number of played missions/ B= sum of all %ofGold, %ofObjectives, difficultyValue , minus every stealthValue. To me, an online (speedrun) scoreboard is not in the spirit of the thief series. a good professional thief stays in the shadows. how about creating a topic with screenshots of the mission end stats. Edited by freyk, 24 September 2018 - 04:09 PM. if added you would need to add a on/off switch so that a score isn't added during beta testing of a map, I test my maps with notarget to make sure AI's are going the right way, or doing the right thing, you end up with a score of zero if you finish a map with notarget turned on.